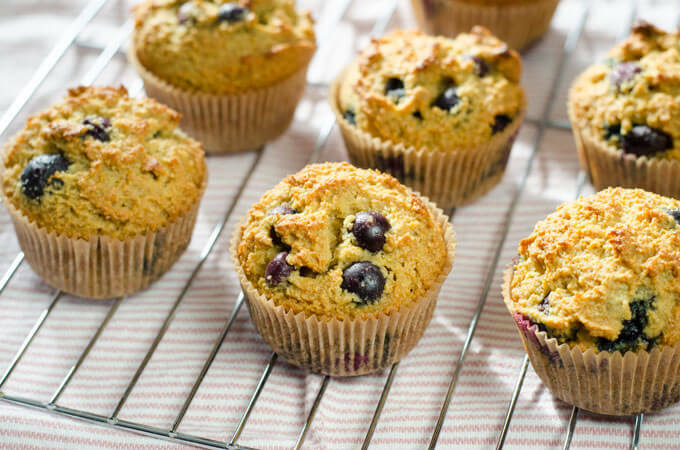 These blueberry paleo muffins are one of my favorite breakfasts. They fill the kitchen with the smell of blueberries, almonds, lemon and honey. There's nothing better than a warm homemade blueberry muffin and a cappuccino on a sunny morning. Combine dry ingredients in large bowl. Combine wet ingredients in medium bowl. Stir wet ingredients into dry ingredients, then fold in blueberries. Note: Like most almond flour baked goods, these blueberry muffins are best eaten the day they are made. You can freeze any that are left over. Reheat the frozen muffins in the oven or toaster oven. Put them in a cold oven, and set it to 300 degrees. The muffins should be thawed and warmed through in 15-20 minutes.